Pagham were held at Lancing - but put six past hapless St Francis Rangers to make it four points out of six. Lancing and Pagham had to settle for a point after an uneventful stalemate at Culver Road. 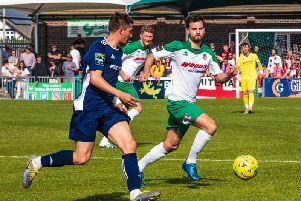 Ash Bailey’s outfit had won the two previous encounters between the sides at Nyetimber Lane earlier in the season – both by a single-goal margin – but, this time, they were unable to break down a Lions side now under the stewardship of Mark Bennett. Lancing boss Ash Bailey admitted that his side were below their best and that a point apiece was the fairest outcome. In a game of few chances, both sides had sporadic openings throughout an evenly contested encounter, as Rob Brown went close with a snapshot for the visitors and Al Fair had a half chance at the other end. Dan Swain headed over and Rich Greenfield flashed a shot wide, but that proved to be the best of the first half openings. Lancers had introduced Lewis Finney in place of Fair and it was the substitute who went closest to winning it late for Lancing with a couple of good chances. He fired straight at Pagham keeper James Binfield on the angle when a pass across goal would have been better, and then volleyed narrowly off target from a Max Howell cross. Pagham were to have a late opportunity of their own, however, as the hosts were indebted to a super save from Josh Green as he kept out Ryan Cox to preserve their clean sheet and point. That proved to be the final chance for either side. The Lions hared into March with a resounding win over whipping boys St Francis Rangers. The Lions lost Jordan Warren to injury early on, with Daryl Wollers replacing him. A rather nervy start from Pagham was broken when Rob Brown hit the first of his four goals on the quarter-hour. A move started by new boy Liam Humphries was finished as Terrell Lewis’s cross was headed in by Brown. Two minutes later the lead was doubled, Brown again heading home, this time from a corner. Three soon followed, a free-kick being pinged into Humphries, who scored his second in two games with a low shot beyond Rangers’ keeper Jake Rudgewick. With just over 20 minutes on the clock, it was 4-0, Brown getting his hat-trick with a strike from a Lewis cross. James Binfield was brought into action only rarely, mainly to take care of the odd wayward shot from the visitors. With ten minutes of the first half to go, it was 5-0 to the Lions as Brown hit his fourth – a daisycutter of a shot beat Rudgewick to leave the visitors reeling. In truth they’d not been completely outplayed, but a record which had seen them already concede more than 180 goals saw them under the cosh again. A rare mis-hit from Lewis brought the first half to a close. After the break, Humphries made way for Neil Murfin. There was another goal for Pagham, two minutes into the half. A goalmouth scramble saw Julian Boniface appear to get the last touch to put the Lions 6-0 ahead. When the visitors did see sight of goal, it was usually through George Booker, although most of his efforts went well wide of the target. Rob Wimble came on to replace Alex Kew before Ryan Cox headed over when clean through. Wimble could have made it seven on 72 minutes, but a rogue patch of pitch saw him slip and miss his chance. The Lions had taken their foot off the pedal and the game became less frantic. With another struggling side in East Preston next to visit Nyetimber Lane, Lions boss Bennett must be relishing the chance to stretch his winning run to five games. PAGHAM: Binfield, A Brown, Warren (Wollers 8), Swain, Boniface, Rowlatt, Humphries (Murfin 46), Lewis, R Brown, Kew (Wimble 58), Cox. Subs not used: Martin, Neighbour.